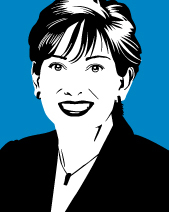 I recently had the opportunity to interview a brilliant CIO, Adriana (Andi) Karaboutis, VP and Global CIO of Dell. Karaboutis has been named one of the top 75 CIOs by CIO Outlook 2013, one of the top 10 women in technology and one of the top 100 women in STEM. A key theme that came out of our conversation, and not surprisingly a key theme of all of the most extraordinary CIOs I have talked to, is Karaboutis' commitment to collaboration with her peers to help the business grow. Karaboutis has turned her 5,500 person IT team into an approachable organization that employees want to come to with ideas - a model that naturally chases out shadow IT, a top concern of many CIOs today. As Karaboutis puts it, "I don't chase shadow IT, I chase innovation." This concept has helped her to co-create value for Dell and delight employees and partners through the company's transformation from a hardware company to a privatized, end-to-end premier provider of software solutions. The hallmark of innovative CIOs like Karaboutis is the ability to maintain a baseline of operational excellence and embrace transformative innovation, while balancing security and delivery of traditional IT functions. We all know this is much easier said than done. Here is some advice from a CIO that is doing it. 1. IT must go beyond being an enabler of transformation, they must be part of the transformation - To help grow the business, IT needs to understand the strategy of the company and to quickly embrace it with their business partners and determine what their part is in helping to achieve and fulfill it. This was especially important for Karaboutis as Dell quickly made the move from a traditional computer company to an end-to-end solutions business, putting a strain on the company's IT organization and demonstrating a lesson in how IT must adapt as the business evolves. According to Karaboutis, "We are trying to do more than 'enable' the transformation, we are trying to drive the business forward with all of our constituents." To help with this she created a business architecture team; not your typical IT steering committee. According to Karaboutis, "We are not a ship to be steered; we are there to be together with the business". The business architecture team drives the people, processes and technology capabilities that are needed to fulfill the strategy of the business and then IT builds the capabilities for that. Karaboutis says that there is a paradigm shift that has to occur as you shift your focus from being solely on the capabilities, to being about the capabilities and about serving up new technology and doing work at the speed of your customers, as opposed to your own processes. IT organizations need to ask: "What do we need as an organization to design, market, sell, build, fulfill and service products and have a 360 degree view of our customer?" 2. IT must use social media to better understand the customer's needs - A report from McKinsey showed that a majority of the estimated $1.3 trillion in untapped value from social technologies lies in "improved communications and collaboration within and across enterprises." As a very social company, Dell uses Salesforce.com's Chatter as an internal social media platform and everybody, including CEO Michael Dell and the leadership team, is extremely active. They are also active externally on a number of social media sites in order to gather insights and try to pull in as much information as they can to understand their customers. Karaboutis says that even within IT they have embraced social media as a way to do business and are ahead of the curve when it comes to applying social media to IT internally, one of the five ways social media will change the way you work in 2013. Where typical IT organizations have a 6-7 step process for opening up trouble tickets, Karaboutis has people scanning social media sites to see how the network is running; empowering people to solve problems for themselves. Karaboutis is a social CIO and active uses social media to demonstrate thought leadership. To those CIOs that say, "Who has time for that," she says, "You don't have the time to not be on it." She says that Twitter saves her time and keeps her current quickly by allowing her to see what is bubbling up, what thoughts are in employees and what many people are saying about a topic of interest. She says that she no longer searches for information, it just comes to her. 3. IT must stop chasing shadow IT, and start chasing innovation - Stemming from a recognition within her IT organization that technology is ubiquitous, Karaboutis says, "When you work in a technology company and have 110,000 best friends that understand technology well and probably even better than you do, you have to be out there working, listening and determining how you can create even more value for the employees and customers that you serve as opposed to being defensive about owning IT." Of course for any good CIO, a secure environment will always be a top concern, as will working on tools that are in the best interest of the company, efficiencies and operational excellence. The difference is the mindset of sharing with your business partners. It is from this mindset that the term "business technology" was coined by Forrester. It's no longer good enough to just be there enabling them; it's working together side-by-side to co-create value and power and enable the company together. The IT team at Dell is actually trying to enable internal customers so they can go develop their own business applications. Karaboutis says that by giving other business organizations opportunities to have their own method for developing and then having them come to IT to secure it drives out shadow IT. Instead of being the organization that is avoided, business partners come to IT and ask for their help and support. A CIO.com article builds the case for CIOs to embrace and support shadow IT based on the idea that a business user's need to scratch a technical itch can provide great benefit to both company and IT. 4. IT must proactively welcome ideas from outside of IT - Achieving operational excellence is a top priority and to deliver a great user experience internally, Karaboutis' team strives to ensure that Dell's 110,000 resources have the tools in hand that they need to drive the company forward. When Karaboutis reorganized her 5,500 person IT group she created an incubation and user experience team to go out and find the great ideas and then pull in the technologies to fulfill them. One example of this in action: When SFDC didn't have an app for Windows 8, which runs on a Dell tablet, her team built it. Now the app is being highlighted at Dreamforce for SFDC. Dell's IT team also spends a lot of time talking to their summer interns, recent college hires, employees and users to understand how they work. They also do reverse mentoring in IT: Summer interns are assigned to mentor an executive in IT. Karaboutis says, "It's a great way to learn how people coming in from the universities like to do work and it gives us great insight into the consumerization of IT, mobility and social to help us decide what type of user experience we want to deliver to our employees." Alan Webber, the co-founder of Fast Company explains reverse mentoring in this way: "It's a situation where the old fogies in an organization realize that by the time you're in your forties and fifties, you're not in touch with the future the same way the young twenty-something's. They come with fresh eyes, open minds, and instant links to the technology of our future". As much as it's about engaging with users to give them good, easy-to-use product, it's also about bringing things to the table that employees and customers don't even realize they need. "It's listening, but it's also saying, 'Hey have you thought about working this way and we have some new technology we want you to try'," says Karaboutis. This is where the pilots and incubation projects have come into play, allowing IT to shape and drive how employees work, and according to Karaboutis, they love it. 5. CIOs must purposefully form an alliance with CMOs - Karaboutis, who recently presented at a Forrester forum with Dell CMO Karen Quintos on winning in the age of the customer, clearly sees the importance of the CIO and CMO working together to help grow the business. But the great partnership that Karaboutis and Quintos share did not happen simply by chance. Together, they created a structured team that reports to both of them and allows the CIO and CMO roles to connect, overlap and intersect on many levels. In this way, IT is able to put the technology in the hands of their business partner and make real progress together. At the end of the day technology decisions are weighed on the common denominators of ROI and how the project will affect the company. As such, the technology agenda is adjusted on a quarterly basis, and if need be, on a monthly basis. 6. IT must embrace disruptive technologies, like cloud computing - It does not come as any surprise that a CIO that is driven by the needs of the business and not by the needs of IT would embrace the Cloud. Karaboutis says that although Cloud is the disruptor that will cause the increasing commodization of traditional IT, IT organizations need to embrace it and the changes it will bring because it is the wave of the future. She sees Cloud as an opportunity for IT to re-define itself apart from the more traditional IT roles and emerge as a critical partner to helping the business achieve and fulfill its strategy, an beat that Karaboutis and her team are already marching to. Andi Karaboutis is an extraordinary CIO who ranks among the likes of Intel's Kim Stevenson, GSA's Casey Coleman, and UNH's Joanna Young, all of whom are proactively collaborating and embracing disruptive technologies to help their business grow, while delighting employees and customers. If you are a CIO or CMO out there, take a lead from this extraordinary CIO and stop worrying about where the budget sits and start collaborating with your peers to help your business grow. Because after all, it's not about IT (or marketing or any other department) it's about the business and the value that you deliver to earned the right to your customer's future business. Also, CIOs must know that CMOs need to partner with CIOs to develop strong marketing capabilities. You can watch the full interview with Andi Karaboutis here. Please join me and Michael Krigsman every Friday at 3PM as we host CXOTalk - connecting with thought leaders and innovative executives who are pushing the boundaries within their companies and their fields.